The marks shown here were long classified as 'unidentified' and one could only assume that they were used by some sort of importer or distributor. 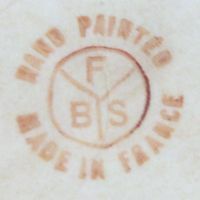 Like other marks of the same genre, these marks are normally found on otherwise unmarked items, however there are enough cases where one of them can be found together with a true manufacturer mark, e.g. 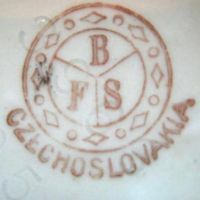 the Czechoslovakian company of Fischer & Mieg. Ferdinand Bing & Co. can be found in the telephone directory of New York and New Jersey as far back as 1888, at least that is what I could find. The Copartnership and Corporation Directory shows that the company in 1890 consisted of Ferdinand Bing, Arthur W. Gans and Charles G. Rathgen. It was located at 106 Grand Street, New York. 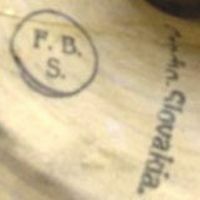 Next to many other items, the company at that time often imported figures from manufacturers in France, Germany and Hungary, some of which were already custom-marked with an 'FB&Co.'. Documents and ledger excerpts from the Hungarian manufacturer Zsolnay note that seventeen objects ordered by Ferdinand Bing & Co., New York, where shipped in November 1891; these consisted of vases and ornamental pitchers with gilding and gold cloisonné, relief floral ornamentation, spiral ribbed necks and stems, and slender elegant handles. In mid-1892, Ferdinand Bing & Co., New York, received another eighty items, mainly from Zsonlay's 'Bamboo' series. Early in the 1890s, the company was involved in a court case as Bing had challenged the amount of import tax due for various figures and sculptures created from either alabaster or marble, as the US Collector of Customs had declared the imported items as " ... industrialized copies of original art, commercial artwork ..." and therefore demanded the full tax rates. Ferdinand Bing & Co. (backed by various artists, including the sculptor Fidardo Landi) on the other hand stated that various items imported by his company were true, original pieces of art, and therefore fell under a lower taxation. Descriptions of the manufacturing process and other statements made clear that each employee of the supplying manufacturer was an educated artist of his own right and created figures and sculptures with an own individual 'touch', meaning that each item (even from the same person) was slightly different. That however was not the case with 'commercial art', as that - per definition - was a form of industrialized mass-production which resulted in exact multiples and did not require the hand of artist. 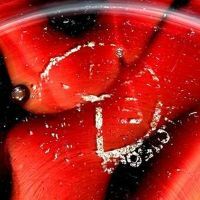 A lower court decision ruled in favour of the Collector of Customs and confirmed the full tax on imported commercial artwork, but Bing did not back down. After a successful appeal (Ferdinand Bing vs. Collector of Customs), the upper court reversed the decision in 1902 and ordered the Board of Appraisers in New York to reappraise works of art imported, dating back to July 18th 1900. One should take note that this touched two different percentage claims: one originally being 30, revised to 20; another being 50, revised to 30. It should be obvious that Bing himself had already sold out previously as the funds returned were rewarded towards Ferdinand Bing & Co. Successors. Most people nowadays only know the form in which the new proprietor either already has (or creates) an own company name to which the old name is then attached, e.g. 'NewExample Co., formerly OldExample Co.'. Legally, that form makes clear that all responsibility and liability from former business of the old company becomes irrelevant. This form is not a full legal succession. Keeping the old company name and adding 'Successors' is an older form of telling customers (and suppliers) that the business had changed direct proprietorship but was continued under the old name. Unlike the German form, this English term does not exactly imply if the successor was family-related or not. Nonetheless, the original company name (in itself) was kept, for marketing or prestige reasons. Legally, the used form states that all forms of liability and responsibility had been transferred to the successor, hence this form represents a full legal succession. 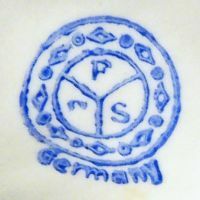 A snippet from 1909 states that Ferdinand Bing & Co. Successors sold "art goods and kindred articles", had a capital of US$ 223,060 and was run by Charles G. Rathgen, Max Leve and Benjamin G. Paskus. From 1911 onwards, the company was run by the director and treasurer Max Leve together with the directors Charles and Fred Hirschhorn. Another interesting fact is that director Charles Hirschhorn at the same time was also the director of the Arch Realty Co., which at that time owned the premises. Ferdinand Bing & Co. Successors continued business with roughly the same product range; various clippings and an entry in the Pottery & Glass Salesman mention that it included "Art Wares and Novelties, Pottery, Bronzes, Marble and Lamps". The company was first relocated to 41 Irving Place; later clippings quote the address as 67-69 Irving Place, New York. Following the collapse of the stock market and the chaos that followed, the company saw itself confronted with the same problems as everybody else. Charles Hirschhorn had invested a lot of money in the real estate market, and under normal circumstances those investments would have been a good idea. But a complete collapse of the economy of course affected all areas at once, thus real estate prices also dropped and Ferdinand Bing & Co. Successors was forced into bankruptcy. The company assets were sold, all hints pointing towards a company owned by Otto Friedlander who later owned a small import business located on 5th Avenue. Not a problem, I thought, as that somehow matched the 'O.O.F.' marks. 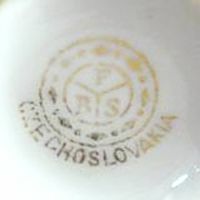 So far I could find, the Czechoslovakian factory of Fischer & Mieg (Pirkenhammer) in March 1937 actually invoiced a batch tea sets to Friedlander Buying Service. 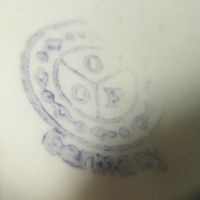 The ten sets covered by that invoice (each consisting of a lidded tea pot, lidded sugar, creamer, six cups and saucers, and tray) were all additionally custom-marked with 'O.O.F. 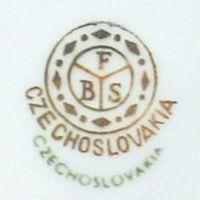 Czechoslovakia'. 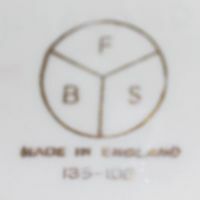 It therefore appears that Friedlander simply adapted his company name towards the 'F.B.S.' abbreviation as he probably still had a large stock of 'F.B.S.' marked items left over from before the purchase. Only later on did he use an 'O.O.F.' mark similar to the former 'F.B.S.' marks. 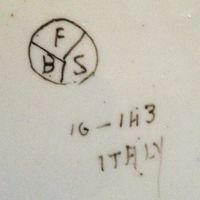 Used between 1918 and 1921, simple 'F.B.S.' mark with offset 'CZECHO-SLOVAKIA' addition. 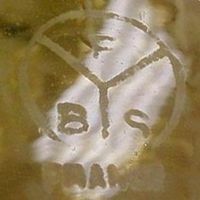 Simple three-segment 'F.B.S.' mark with 'BELGIUM'. Simple three-segment 'F.B.S.' mark with 'MADE IN ENGLAND'. Simple three-segment 'F.B.S.' mark with 'MADE IN FRANCE'. Bordered 'F.B.S.' 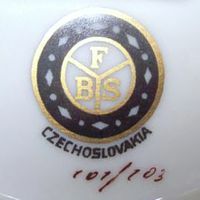 mark over 'CZECHOSLOVAKIA', all in gold. 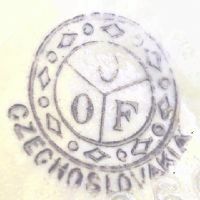 Same as before but over an additional green 'CZECHOSLOVAKIA' marking. Bordered 'F.B.S.' mark over 'GERMANY', all in blue. 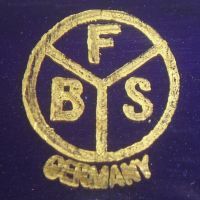 'F.B.S.' 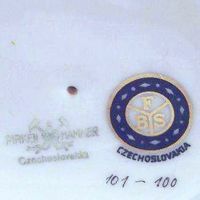 mark with a filled rim over 'CZECHOSLOVAKIA'. 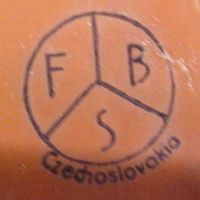 'F.B.S. 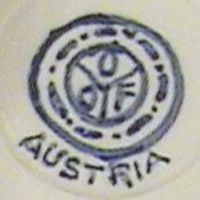 ': Same as before but on a Fischer & Mieg (Pirkenhammer, Bohemia) item from between 1918 to 1938. 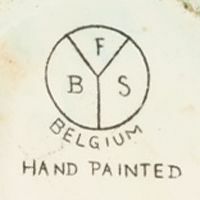 Bordered 'B.F.S.' mark over 'CZECHOSLOVAKIA', all in red. Bordered 'O.O.F.' mark above 'AUSTRIA' (Austria, not Austrian Bohemia). Bordered 'O.O.F.' mark above 'GERMANY'. Bordered 'O.O.F.' mark above 'CZECHOSLOVAKIA'.